Found this beauty recently on Ebay after 6+ years of searching and received it Monday---it is ivory instead of black/dark-brown like Grandparents' set, but just too nice (and rare) to pass by. Only needs a bit of cosmetic attention along with a good detail/cleaning... Electronically, the volume control needs a dose of DeOxit Faderlube and the tuning cap needs a good "fin-cleaning" as it's very scratchy/noisy. The filter caps also need replacing as there is a trace of hum in audio. Appears to have all original DuMont tubes. Remember wondering why Grandparents' set didn't have a dial-light with that neat slide-rule dial and found out when I pulled back off of mine tonight that they do---just the bulb is burned out ! Must not have lasted long... PCB seems very cheaply made and only has a couple caps and resistors along with a Couplate. The vinyl insulation on the dial-lamp socket leads is "decomposing" and there is an oily mess where it has dripped off... It was a perfect radio for use on the kitchen table as it has speakers in both ends---am wondering if this was a selling point for Nana & Grandpa Buddy ? Cool it has duel speakers and a ferrite rod antenna. Good that the rectifier tube has not burned out due to open dial light. #47. Replace that .047 line bumblebee capacitor with a safety cap. Of course replace the filter cap with individual modern day capacitors. One thing is the PC board where it rides on the mounting rails. Have seen where the foil runs become open there due to vibration. Can use jumper wires if need be. The dial light socket can be taken apart to replace both wires. The center contact wire strip the end very short can use shrink tubing too. I've never seen a DuMont radio, but years ago ordered a half dozen 12AV6 tubes and they were labeled Dumont, both tubes and boxes. 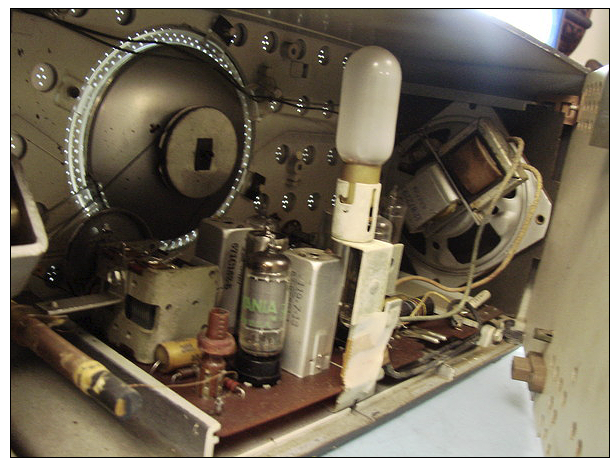 Probably the tubes are from an RCA factory, but were replacement tubes for Dumont products, which included TV's. Retro-tronics used to carry a back for that radio, but there's no pic of the front. 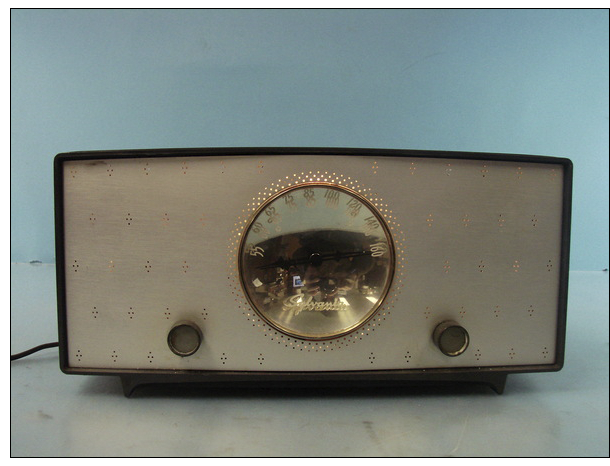 A Photo-fact for that radio was published in 1957, so manufactured maybe 1956 for sale that Christmas and into 1957? That was the usual target, the Xmas season. The Dumont 1130 is not found in Bietman's for 1956, but is in the 1957 version, page 24 in your pdf browser. That one was probably made by Emerson, shortly after the two companies merged in the 1950's. They continued to sell products with the DuMont brand name for many years. DuMont aftermarket replacement tubes were popular for a while, and sold by places like Olson electronics and other small local distributors. They had gold cartons and were sourced from several tube manufacturers. The OEM tubes in this radio were made by Sylvania. Emerson bought the consumer products division of DuMont in 1958. This radio is in Sam's Photofacts already in April of 1957, so it should be a pre-Emerson DuMont. "Emerson Radio to Buy DuMont Laboratories Consumer Products Unit", Wall Street Journal, July 7, 1958, p. 13"
I wonder who built this one then? I was always told that DuMont never built any radios with their own name on them with the exception of the Chinese table model, and the radio chassis which were included in TV combinations. I first heard that information in the early 1960's from people who worked for DuMont factory servicers. They may well have contracted some table model radios in the mid-50's, you sure don't see very many with that brand name. Photofact says "MANUFACTURER Allen B. Dumont Laboratories Inc., 2 Main St., Passaic, N.J."
That is the clock radio version, BTW. Beitman's shows the OP's circuit, I think, alongside the clock radio circuit. John, that's a very attractive radio, never seen one before. I like the idea of having 2 speakers, great find. Jim's photofact is correct, it just happens to picture a clock model + chassis photo. My SONY TR-711 also has side facing speakers. Last edited by egg on Apr Sun 01, 2018 12:44 pm, edited 1 time in total. Thanks very much for responses, Guys ! Westcoastjohn---really appreciate the mention of the Beitmans as I hadn't even thought to look through them even though I have the entire set saved on computer. Viewing the very good factory service info there clarified that the 1130 mentioned in SAMS was indeed this radio and led to an apology to Wiscojim. Had no idea until then that the same basic circuit was used in several sets at that point in time ! Dennis---I also wonder if Dumont truly made this set or if it was a contract build. At least we now know when it was made ! Rocco---seems to be a very rare set, also... Have only seen two others anywhere in my lifetime including Grandparents' set ! Greg---don't regret buying it at all since the memories it brings back of time spent at my Grandparents' kitchen table are golden... The side-facing speakers are a great feature in that application when people are sitting on both sides of table. "Don't know a whole lot. I found it at an Estate sale in Atlanta. The family had moved to the US from France in the 1940's and lived in the same house until recently. I use to collect radios and recognized this one as rare. Plus it was in such nice original condition I had to buy it. Never seen another one in this color." You guys wanna know who really made this radio? I knew right away by looking at it. This radio is actually a Sylvania! As some of you may know, I'm a big time plastic, post-war AA5 collector. Those speaker grill designs were a dead giveaway. Then the pictures of the insides verified it. The circuit board design and the cabinet. See all those mysterious "holes" in the cabinet, only visible from the inside. Seems odd, right? It's called repurposing ladies and gentlemen. 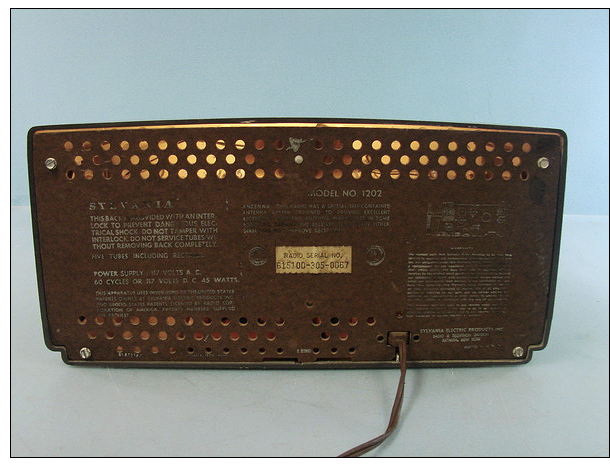 The original cabinet for the original manufacturer's design was designed to let -light- out via the holes. In the 50s, Sylvania offered a clock radio and a straight table radio line with its night-time themed "Starlighter" series. Kinda disappointed it's not a "true" Dumont design even though suspected otherwise before comments were made here, but Sylvania did make good products... Or did someone else make the PCB for both and perhaps other companies ??? Oh oh---Joe beat me to the post !!! Seems to be for both 1202 and 2301 models, you can clearly see the holes in the front grill of the photofact. This time Rocco got me ! Last edited by egg on Apr Sun 01, 2018 12:46 pm, edited 1 time in total. Hey Greg---thanks for pics ! If I could find a black/brown one of those with excellent case and knobs, could "up-convert" it to Grandparents' DuMont !!! This set was sure designed to be easily assembled and serviced---remove the volume knob and one screw in center of radio bottom, desolder the audio output transformer primary wires from terminal posts on top of PCB and it easily slides out of cabinet ! The tuning dial mechanism is attached to cabinet front and a pin in pulley engages a slotted lever pressed onto tuning cap allowing easy separation. And the lever makes a good "knob" for tuning with chassis on bench ! Haven't worked on an old TV for around 30 years, so had to dig out one of my cheater-cords to test radio from a storage bin in closet---glad I kept 'em ! Speaker assemblies are also removed easily by lifting the back cover mounting screw brackets upward like a latch and sliding them out. Hope to get cabinet & knobs cleaned tomorrow and post more pics !